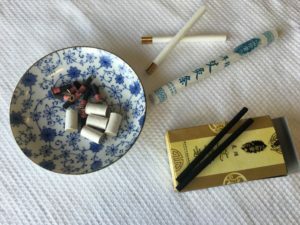 Moxibustion (灸) is a therapeutic method that utilises the burning of specific combustible materials over the points or affected area in order to prevent and treat diseases. The original material used in this method is Moxa– Chinese mugwort (Artemisia Argyi) leaf, although the herb-compress / plasters also are developed to produce a warm-hot stimulation in the clinical application. Mugworts are fragrant, so they can be used as herbs to flavour food. Their unique functions also make them very popular in Chinese, Japanese and South Korean traditional medicine. According to the Chinese herbs classic “bencaocongxing”, mugwort leaf can generate heat and penetrate deep inside body through meridians to promote circulation. As it is easy to be ignited, it can quickly warm body, especially the uterus to remove cold damp, reduce swelling and stop pain. 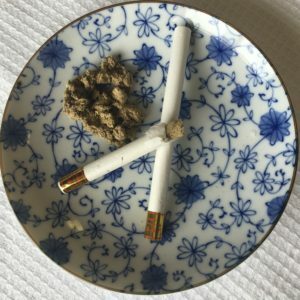 Therefore, moxibustion is used to treat chronic arthritis, general weakness (tired/lower energy), painful period, breech baby, common cold, chronic diarrhoea, sports injury, etc. It is also widely used in health prevention. Mugworts are specifically processed into moxa wools / cones / sticks for different clinical purpose. The warming needle is the most popular one used in clinics. During treatment, the handle of needle is wrapped with dried, fluffy moxa wools or coated with one section (about 2cm) of a moxa roll to be burned. This allows the warming sensation to deeply penetrate down the needle into the area of the points. Moxa cones or a section of moxa stick can be also be put onto slices of ginger / garlic / herb cake and placed directly on the skin during treatment. These can enhance the therapeutic results. Moxa stick is another popular one used both in the clinic and home. Dried, fluffy moxa wools are rolled into cigar shaped sticks. During treatment, one end is lighted and the moxa stick is moved up and down slowly above the points. A nice warming sensation is produced over time and this sensation penetrates the skin. Modern research shows that moxibustion can regulate different systems inside body. It increases the growth of neural stem cells in the central nerve system and adjusts sexual hormones, adrenaline system and secretion of insulin. It can activate the cells’ response to strengthen the immune system. By changing microcirculation and lipid metabolism, moxibustion can improve digestive function. It also can benefit the pulmonary ventilation function to benefit asthma patients. Turning breech babies by moxibustion has been proven to be effective through extensive research and has been widely used in the clinic for many years.